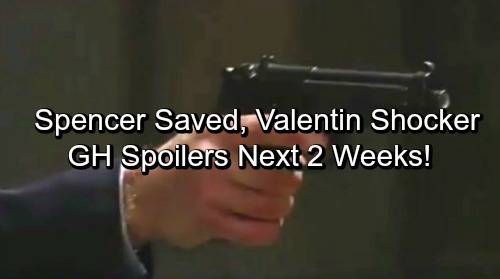 General Hospital (GH) spoilers for the next two weeks tease that a dark cloud will hang over Port Charles. Trouble will lurk around every corner. The week of July 24-28 will deliver more stress for Sam (Kelly Monaco). You know what that means. Sam will face another round of Sonny (Maurice Benard) hallucinations. Her vengeful desires will definitely grow stronger. 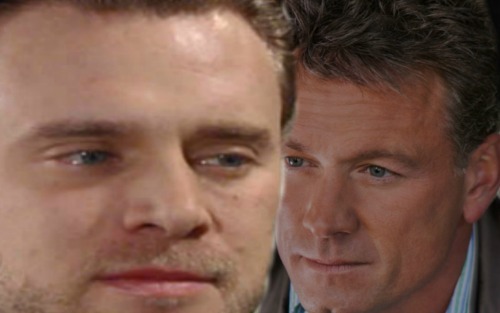 As Jason (Billy Miller) is drawn further into Sonny’s web, Sam will finally snap. General Hospital fans will see some stunning moments as Sam confronts this threat. She’ll shoot Sonny after he has a showdown with Garvey (Rick Gavanello). Sonny will be left for dead, but we all know he’ll pull through. Meanwhile, Liz (Rebecca Herbst) will enjoy some quality time with Hayden (Rebecca Budig). Unfortunately, it’s just the calm before the storm. GH spoilers reveal that Liz will be held captive. She’ll fear for her life, but Carly (Laura Wright) and Dante (Dominic Zamprogna) will come to her rescue down the road. Hayden will deal with problems of her own thanks to Dr. Obrecht (Kathleen Gati). She’ll realize her past isn’t quite as buried as she thought. Elsewhere, the search for Spencer (Nicholas Bechtel) will lead to some surprises. Spencer’s escape will finally put an end to the stress. Maxie (Kirsten Storms) will also return to her overjoyed hubby. Nathan (Ryan Paevey) will welcome Maxie home, but he’ll keep secrets about what he’s been up to with Amy (Risa Dorken). Mac (John J. York) will urge Nathan to withhold more info from Maxie, so we could see a very suspicious wife soon. The week of July 31-August 4 may bring some good news for Ava (Maura West). An intriguing offer will give her a glimmer of hope. It’s clear that Ava needs something to lift her out of this funk. Perhaps this will be exactly what she needs. Valentin (James Patrick Stuart) will be the source of the interesting proposal. However, things won’t seem as hopeful for Hayden. She’ll feel some guilt as Dr. O’s plot continues. Will Hayden hide what’s happening from Finn (Michael Easton)? General Hospital spoilers state that Finn will plan something special for Hayden, but it probably won’t work out like he expects. Jason will have a hard time wrapping his head around Sam’s situation, but he’ll try to stay strong. Still, Sam’s downward spiral will spark a major family crisis. At Wyndemere, Valentin will face an unanticipated battle. When an intruder appears, Valentin will take action. Across town, Laura (Genie Francis) will get a warning that leaves her rattled. On the bright side, Spencer will be back home where he belongs by then. That’ll be a huge relief for Laura. GH viewers will be anxious to see all the drama. We’ll give you updates as other details emerge. Stay tuned to the ABC soap and don’t forget to check CDL often for the latest General Hospital spoilers, updates and news. General Hospital Spoilers: Does Lulu Deserve Custody of Charlotte – Is She Being Selfish?